Following 12 years of active Army service in August of 1998, General Hanifan became a member of Nevada’s Army National Guard beginning his service as a Major. During the succeeding years he commanded at both the battalion and brigade level. He was promoted to brigadier general in 2013 and has served as the Commanding General of the Army National Guard until becoming the Assistant Adjutant General of the Nevada National Guard. Presently he is also the Deputy Commanding General (RC) of the U.S. Army Intelligence Center and Fort Huachuca, Arizona. 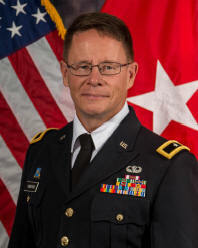 General Hanifan has earned a Bachelor of Science Degree from the United States Military Academy and a Master of Science Degree in Strategic Studies while attending the Army War College. General Hanifan has successfully blended a military career with his civilian career working for Bently Nevada as a Program Manager. $38.00 per person, gratuity included. Business Casual or military uniform. Veterans are encouraged to wear their decorations. Menu: Carved Prime Rib, Lemon Chicken, Baked Salmon in Dill Sauce, Fresh Vegetable Saute, Wild Rice Pilaf, Mashed Potatoes with Gravy, Garden Salad, Fresh Baked Rolls and Butter, Coffee and Tea and Cheesecake with Strawberry Sauce for Dessert.